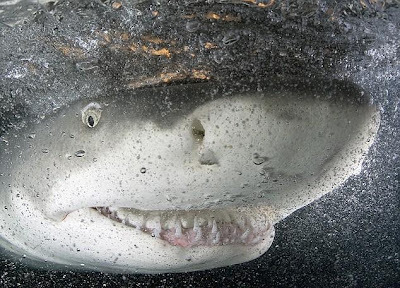 This award winning image shows the extraordinary moment when a lemon shark gazed into a lens with an apparent cheeky grin. Showing a close-up of a lemon shark's face on the surface at sunset, it was recently selected from more than 20,000 photos as winner of the Oceans division of the international Nature's Best Photography 2008 Windland Smith Rice Awards. Amateur photographer Bruce Yates, snapped the aptly named 'Cheshire Cat Grin' photograph in July last year in the Bahamas. 'The shark was roughly eight feet long and only a few inches from my camera,' describes Bruce, who snapped the creature on a 15mm 'fish-eye' lens. 'However, I was not actually in the water for that photo - it was taken between dives when I was sitting on the back swim-step of the boat holding my camera partly submerged. 'Dozens of lemon sharks were around the boat vying for small bits of fish. 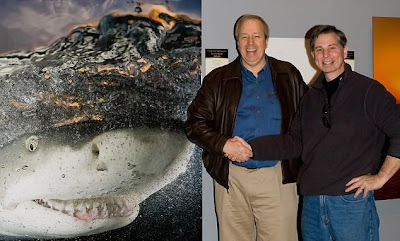 'I pre-set my camera's shutter speed, aperture and strobe strength (so the sunset would be visible in the background), and as sharks came near my camera, I shot dozens of photos in a 'burst'. 'Although this particular photo makes it look like the shark is smiling, it is really just closing its mouth after trying to grab a bit of fish. The lemon shark inhabits coastal inshore waters from around America, Brazil, America, the Caribbean, the Gulf of Mexico and other areas in the Atlantic. Bruce, who owns an investment management firm, first got into photography 15 years ago when he undertook a SCUBA diving course, and his passion for nature photography has led him to many remote parts of the world, from the Arctic Circle to the coral reefs of Indonesia.